Now that you’re done designing your deck it’s time to move on to the next stage. You might be thinking that you’re ready for the construction stage but hold your horses there’s still a little more preparation to be done. You first have to determine the materials you want to make your deck from. These materials will determine the aesthetics, strength and durability of the project so it’s a task well worth putting the time into. Here are some of the things you’ll need to consider when choosing your decking materials. The cost of decking materials is one of the biggest concerns for most owner-builders. You want nothing but the best for our decks, but but that doesn’t necessarily mean you have to use the most expensive materials. Check for alternatives that might offer the same quality and style at a much lower cost. The availability of hardwood timber determines its cost. Most hardwood timbers are quite expensive, with prices increasing in proportion to rarity. As a rule of thumb, indigenous timber makes a better choice than import, as the abundance of local trees should significantly reduce the cost. WPC (Wood plastic composite) and uPVC (unplasticised PVC) are essentially synthetic versions of wood. WPC is a combination of wood fibres, plastics, and filler materials. uPVC is a more durable version of PVC. These sorts of decking materials are cheaper than most hardwood timber as they can be manufactured in mass quantities rather than having to be grown over a span of years. There are areas that may require the use of steel. The cost of steel varies depending upon its size and form. Durability pertains to the ability of the material to last under certain types of conditions, while strength pertains to its ability to support certain amount of load. Certain types of timber are renowned for their durability. Some can resist rotting, termite attack, and even fire enabling the wood to last for many years. Wood is the best material for decking, posts, and support because of its considerable strength. Compared to wood WPC and uPVC are more durable. These sorts of materials can last longer because of its synthetic composition. WPC and uPVC are made from non-biodegradable substances not susceptible to deterioration but they’re considered more flammable than hardwood timber. WPC and uPVC are inferior to wood in terms of strength. Steel can last for so many years if painted properly and regularly. The bigger the size the greater amount of load it can take. Along with the strength and durability of your deck, you also need to consider the aesthetics. One of the main reasons why wood decking is so popular is because the colour and texture of wood has a very natural aesthetic. Different timbers each have a unique colour, texture and scent that can compliment your property. WPC and uPVC possesses the same colour and texture as wood. You can use it as a substitute for certain types of woods not available in your area, allowing you to mimic a distinct texture and colour without having to buy expensive types of timber. Being synthetic products, WPC and uPVC don’t have that distinctive timber smell. Decking materials are exposed to a variety of conditions that will cause them to deteriorate. You can slow or halt deterioration through proper maintenance. Wood requires regular maintenance to remain rot and termite free. Every few years another application of stain or oil will keep your deck looking new. Any damage should be repaired immediately. The good thing about WPC and uPVC is that it doesn’t require much maintenance. It’s non-biodegradable so is able to retain its original characteristics indefinitely. It doesn’t stain easily, and if it does it only requires simple cleaning. Steel requires regular maintenance as it can easily corrode if exposed to air. Properly and regularly applied rust-proof paint will vastly increase the longevity of a steel deck. The type of material you choose determines how easy the project will be. It’s best to choose decking materials that can be easily worked. Wood workability depends upon the type of wood you’re using. Timber is sturdy, but it’s susceptible to splintering. When dealing with expensive timber you should consider whether you have the skill and experience required to work theose materials. WPC and uPVC are designed to be builder-friendly and require less hands on experience than timber. WPC and uPVC are preformed and customized according to what your deck requires. Steel is difficult to work with especially if you don’t have previous knowledge and experience. This sort of material requires special equipment and procedures. It’s best to work with an expert when dealing with steel. Choosing the right decking material is a task worth spending time and effort on. Selecting the best materials will save you money, time and effort. It will ensure that your deck has the kind style you’re looking for and will help your deck withstand the test of time. What material will you use for you deck? 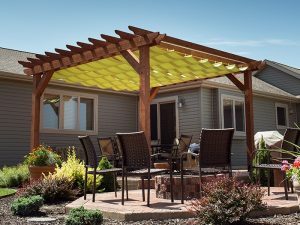 Will alternative decking material save you from overspending? What material will make your deck durable and strong? Let us know as we really love to hear from our fellow Owner-Builders. Don’t miss the next post in which we’ll discuss the necessary preparations needed before the actual construction begins. You can find it here. Join us as we continue our journey to successful deck building!